It's a beautiful Sunday morning and I am sitting out on the lanai watching a little Tricolored Heron fish for his breakfast. Bill is off to the last day of the Gathering of the Giants airshow at the R/Seahawks Park on Cape Coral and Mike and Mel are sleeping in. 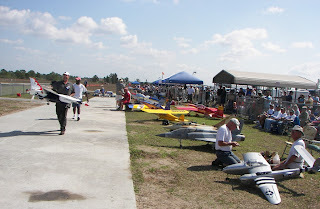 We all attended the airshow yesterday and they had a wonderful turnout with lots of fabulous planes. The weather was perfect in the morning - but the wind picked up a bit in the afternoon. Fortunately, the wind is not as much of a factor with these planes. Bill had the camera for the day so these are some of the pictures he took. 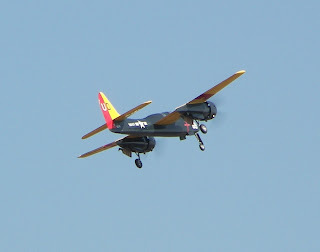 Most of the planes were fueled by gasoline - not the electric - battery powered - ones that Bill flies. There were also a few jets. One of the young instructors, Alex, flew a demonstration that was mind boggling. 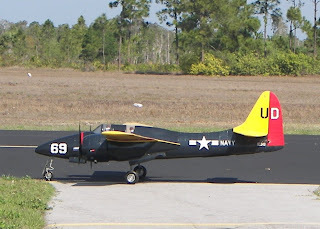 He made that plane stand still just a few feet over the runway and did flips and loops like I'd never seen before. Earlier in the week, we took what was probably our last trip to Six-Mile Cypress Slough this season. I'm never disappointed with our walks there - and I always see something new. 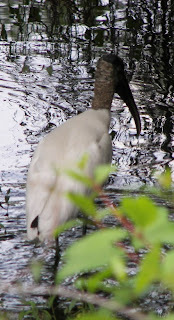 I don't remember ever seeing a Wood Stork at Six-Mile before - but I'm sure it's a good fishing spot for them. 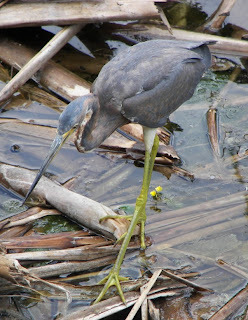 The Tricolored Herons are quite a bit smaller than the Great Blue Herons. I think I finally have them straight in my mind. We watched this Tricolored from one of the boardwalk observation decks. 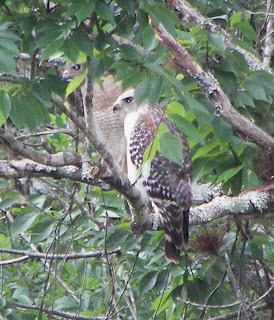 Love is in the air - a beautiful pair of Red-shouldered Hawks in the trees. Mel, Mike and Bill. We are fortunate to have Mike and Mel as house guests until Wednesday when they will head back to their home on Table Rock Lake in Missouri. 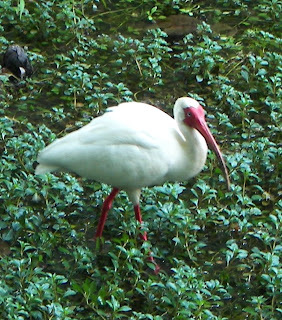 This time of year even the common Ibis are gorgeous. Just look at how bright red his bill and feet are! 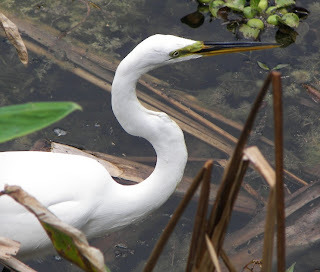 You can really see the lime green facial skin on this high breeding adult male Great Egret. 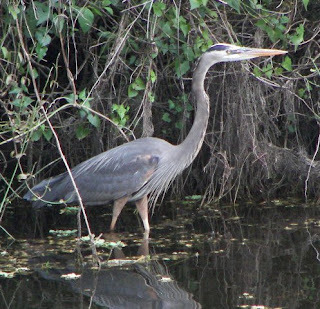 I never get tired of looking at the Great Blue Herons. 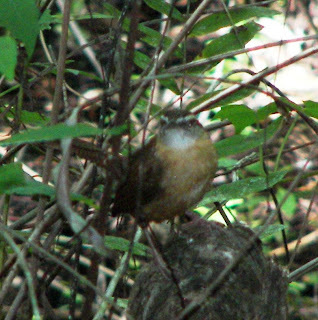 We heard this Carolina Wren's melodious song long before we finally located him sitting on a Cypress Knee in the underbrush. 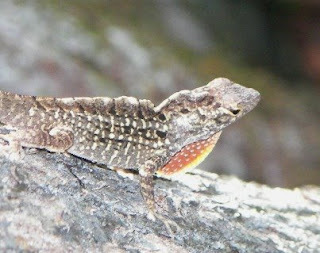 Even the common Brown Anole are showing their colors. 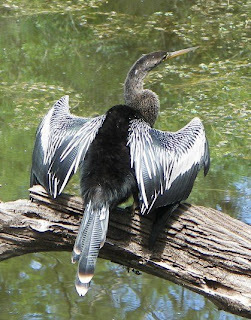 How could I visit the Slough without taking a picture of this wonderful Anhinga showing off his fancy wings? 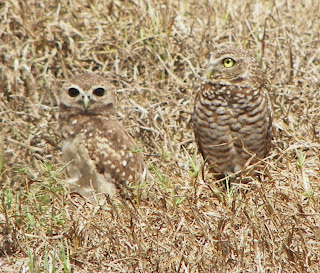 Back over on Cape Coral we are finally seeing some of the baby Burrowing Owls outside their deep burrows. This little guy has huge black eyes - unlike the adults that have yellow eyes - and a fluffy buff-colored chest. He will get the darker markings when he is a little older. I'm glad Mom is keeping a close eye on him!